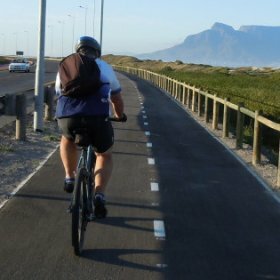 On February 1, the City of Cape Town is planning to officially launch a new cycling and walking route along the West Coast to Cape Town. The new cycling path from Cape Town to Table View is a completely separate bike path, three metres wide, following the new Integrated Rapid Transport (IRT) bus lane, along the R27 for pedestrians and cyclists to enjoy. At 16km, it is the longest dedicated cycle path in the country. There is now a faster and safer way to commute into town than travelling by car, a great recreational facility and the new route is also creating awareness to motorists that cycling is a popular form of transport and exercise. And, cyclists will be happy to hear that when the wind is howling and you don’t feel like riding home, you can hop on a bus with your bike. Participants from the City, local cycling community and media will participate in a mass group ride that will allow us to see the route in all its glory. The ride will start officially at Woodbridge Island, where cyclists should congregate from 6:15am onwards. There will be a very brief ceremony, and the ride will start by 6:45am. Some cyclists will begin cycling from Dolphin Beach and meet the rest of the group at Woodbridge Island. The ride will end at the Civic Centre Station, on Hertzog Boulevard. This entry was posted in Sustainable living, Transport and tagged Bicycle, Cape Town, Transport. Bookmark the permalink.